Set retention method to "Overwrite events as needed" or "Archive the log when full". Open Event viewer and search the application log for the 11707 event ID with MsiInstaller Event Source to find latest installed software. #Generates human readable userID from UserSID in log. #Generates email body containing time created and message of application install. Add arguments (optional): -File "specify file path to our script"
Now you will be notified about every software installation on your Windows server via e-mail message that will contain details on software installation time, software name and installer’s userID (SID). 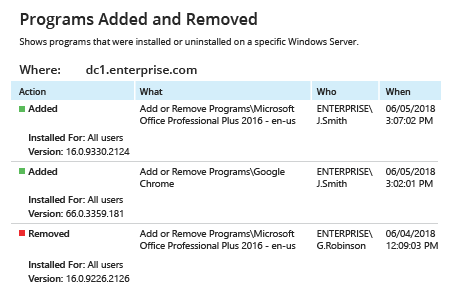 Run Netwrix Auditor → Navigate to "Reports" → "Windows Server" → "Windows Server Changes"→ Select the "Programs Added and Removed" report → Click "View". To receive the report regularly by email, click the "Subscribe" button and choose the schedule you prefer. From the Netwrix Auditor home page navigate to "Alerts" → Click "Add" → Specify alert’s name. Switch to the "Recipients" tab → Click "Add Recipient" → Specify an email address where you want the alert to be delivered. Value - "Add or Remove Programs"
Click "Add" to save the alert. 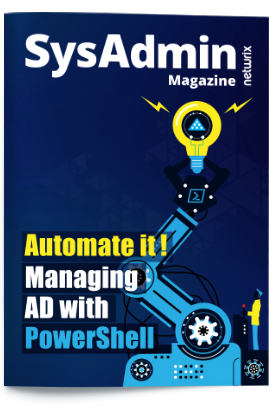 Accidental or intentional unauthorized software installation on Windows Server can enable malware to enter your network, which can lead to performance problems and the loss or leakage of sensitive data. Threats come from both inside the organization as well as from hackers on the outside: Employees may unknowingly download and install malicious programs, therebyviolating your software installation policy. That is why it is critical to be aware of what software was installed, who did it and when it happened. To reduce the risks of breaches and downtime, IT pros need to be able to detect when new software is installed and quickly determine all the who-what-where-when-what details. 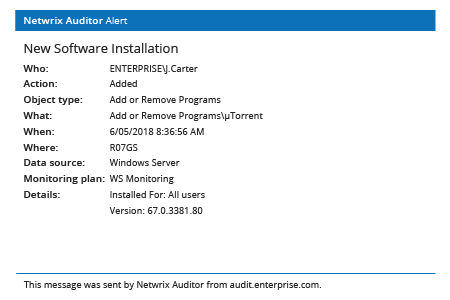 Netwrix Auditor for Windows Server delivers complete visibility into what is happening across your Windows Server infrastructure, including unauthorized software installation. 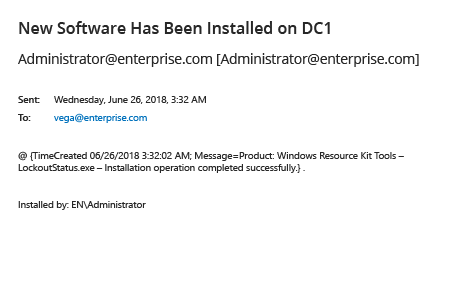 IT pros simply create an alert and they will immediately receive a detailed e-mail notification whenever new software is installed, so they can fully secure the organization’s assets.